Dental implants are permanent solution for replacing missing teeth. It also provides an excellent support and stability for for removable partial or complete dentures. Dental implants are artificial roots, made of titanium, and teeth that are surgically placed into the upper or lower jaw bone. The teeth attached to implants are made to look and function like your natural teeth, enhancing your smile and restoring your mouth functions. The process of getting implants requires multiple visits over several months. 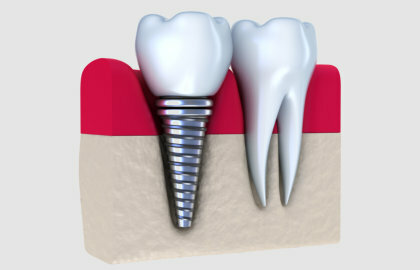 Dental implants are very strong and durable and will last several years. However, they require to be re-tightened or replaced due to normal wear and tear. Part of the dental implant procedure is to take X-rays and impressions (molds) of the jaw and teeth to determine bone, gum tissue, and spacing available for dental implant. The affected area is numbed with anaesthetics before the implants are surgically placed into the bone. It is allowed six months to heal and integrate itself onto the bone. Sometimes, a second surgery may be required in order to place the titanium post that will hold the artificial tooth in place. There are other types of dental implants with posts and anchors already attached, which can be placed at the same time, eliminating the need for a second procedure.